They call it the man cage. A steel mesh box painted a tired yellow, it delivers about a dozen men at a time into the bowels of Manhattan to tunnel through bedrock. On Friday morning, the crane that runs the cage was on overdrive, hoisting workers out of the 130-foot deep burrow to meet a gregarious, perpetually grinning man of the cloth who was there to shake hands, slap backs and give his blessing to the work — Timothy M. Dolan, the new Roman Catholic archbishop of New York. 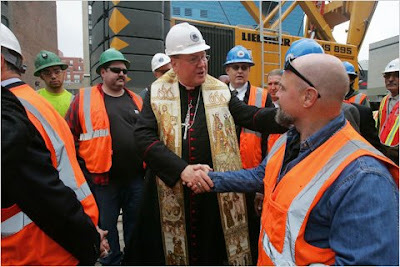 Archbishop Dolan, as part of his orientation as the new leader of the archdiocese, spent about an hour at the noisy site at 25th Street and 11th Avenue, among the workers commonly known as sandhogs. They were preparing to drill a tunnel extending the No. 7 subway line to 34th Street and 11th Avenue, a $2.1 billion project expected to be finished in 2013. 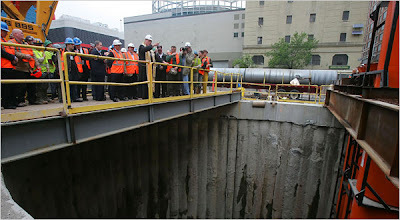 A project supervisor had asked for the archbishop to come, said Richard T. Fizsimmons, business manager of the sandhogs’ union, Local 147 of the Laborers’ International Union of North America. Wearing a hardhat over his traditional purple zucchetto, Archbishop Dolan wound slowly through the crowd of muddy workers, posing for photos, offering friendly words of encouragement and trading blessings, occasionally tracing a cross on workers’ protective hats. After the greetings, Dolan gave a brief blessing at the precipice. Then he shook more hands. The blessing coincided with the church’s Feast of St. Joseph the Worker. Let us pray: Oh God, you are never far off from those who serve you; and with fatherly protection you always guide those who trust in you. Bless this tunnel, those who are constructing it, and those who will use it. For those working here on this Feast of St. Joseph the Worker, may those who labor here know that their labors may always be united and offered in the service of the Lord. For those will use this train, may the grace of God be the guide that goes before them and the companion to sustain them on their way. By your favor, protect them from adversity, so that they may arrive safely at their destination and accomplish what they set out to do. We ask this through our Lord Jesus Christ, who lives and reigns with you and the Holy Spirit, one God forever and ever. Amen. Dolan told about his most recent confession, at a New York City church. The priest who heard Dolan's confession had no idea who the person confessing was. And after Dolan confessed his sins, the priest sought to pass along a little wisdom to him — from a very familiar source. "Let me tell you something our new archbishop said," the priest said to Dolan. "Did you listen to the new archbishop's [installation] homily?" The congregation was almost on the floor with laughter at that point. Then Dolan delivered the payoff. "I was afraid, for my penance, he was going to say to listen to it again," Dolan said. Of course, you could do far worse than to hear it again. And the other one, to boot.